Feast your eyes on and fry your spectators' brains with six more insanely impossible impromptu card miracles. 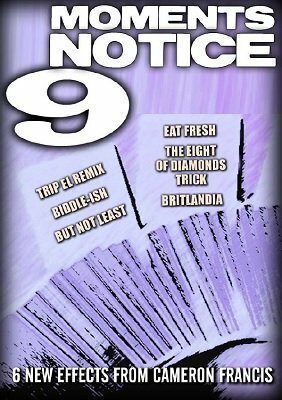 TRIP EL REMIX - An amped-up version of a classic triple prediction trick with a major kicker ending. A serious fooler - and best of all, it's entirely self-working. BIDDLE-ISH - A lean, mean, super-clean "Card Across" effect. You've never seen this spin on a time-tested classic of card magic. BUT NOT LEAST - A wildly deceptive triple sandwich effect with an eye-popping, in-the-spectators-hands ending. EAT FRESH - Inspired by the Buck Twins' legendary "Subway" - but you don't have to be Dan or Dave to do it. Lucky you. PAUL GORDON'S EIGHT OF DIAMONDS TRICK - A self-working card location that will bamboozle everybody (including all your magician friends). BRITLANDIA - A zippy, nifty variation of Ed Marlo's famous "Elevator" effect. It's extremely easy to do, and features an in-your-face visual ending. Boom! 1st edition 2015, 21 pages + YouTube links to performance videos.